Named after the First Baronet of Bristol and the artist Bernini who sculpted the city’s Triton Fountain, the hotel began welcoming guests in October 1874. It benefits not only from its reputation as a luxury hotel, but also its enviable position at the start of the Via Veneto near the Trevi Fountain and The Spanish Steps. More than a mere handful of European royals have found their way to the Bernini Bristol - these include Prussian Emperor Frederick II and Tsarina Catherine of Russia. 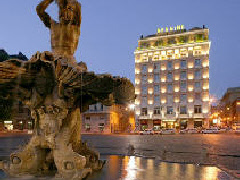 Today, the Bernini Bristol offers over 120 rooms and boasts a rooftop restaurant.